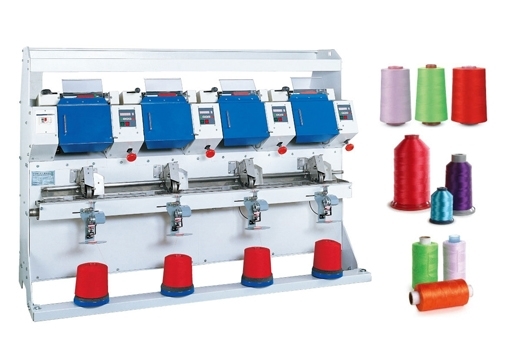 High Speed Cross Cone Winder(4 Spindles)(TN-35) - Taining Machine Industries Co., Ltd.
Yarn speed adjustable. 400~1,000 meter/per minute. Release the tension from beginning to the end, it makes the winded package good appearance. Keep always the full level of oil to each spindle. Big-scale return oil trough and oil fender to filter without pollution and oil waste. One oil filter is devised for every oil wheel to reduce the oil slinging out. One oil tank can supply for the use of 24 spindles. Detachable filter, easy to clean. High speed operation, 5 to 6 times faster than conventional models. Supports a wide variety of bobbins from 0'00" to 5'57" degrees. Sensitive, contact free thread detector. Automatic door lock during operation.